This was passed to me by my friend, Veda and now Triputi and Purva has tagged me with Magic lamp too...thanks gals. Thanks again for the prompt comment !!! Stew's the best combination with Appam. Either veg/ Chicken. Nice to know that you enjoyed God's own Country's Munnar. My native place's 5 hrs away from Munnar. Munnar tea's very famous and spices also. Fish curry's from '' offshore oil rig'' catering crew - Miri Sarawak Malaysia. I think this fish curry gravy goes with Parota / Roti canai. You'll get flaky Roti canai in singapore. u have something in my blog. 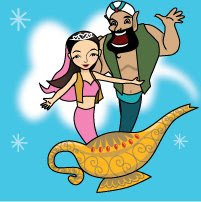 congrats for the magic lamp,..
Hi u have something on my blog!!!! madam why dont u post anything these days. R U feeling well?